Herbert Edward Rowold (1898-1955), was born on July 12, 1898, at Marquette, Wisconsin. He married his wife Freda B. Griffith (1896-) on December 3, 1921. They lived at 1509 East 10th Street, Kansas City, Missouri. In 1923 they lived at 1510 Forest Avenue, Kansas City, Missouri. In 1930 he lived at 113 Gillham Road, Apt. 1, Kansas City, Missouri., and worked as a shoe salesman, and Freda was the apartment building manager. Later on he resided at 1307 Brush Creek Boulevard, Kansas City, Missouri. 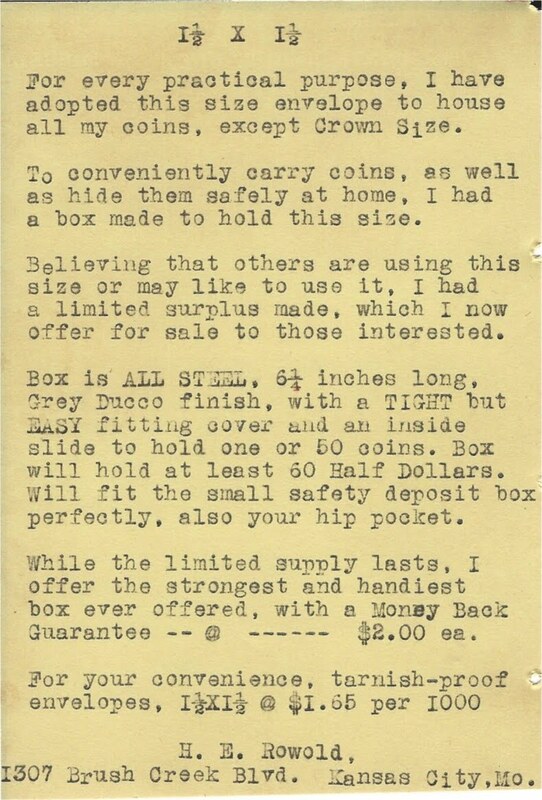 He was a coin dealer and specialist in the study of Illinois State sales tax tokens and designed and created the 1-1/2" x 1-1/2" paper coin envelopes and their metal storage boxes. He also specialized in pattern pieces and U. S. commemorative coins. In 1934 he was a founding and charter member of the Heart of America Numismatic Association. He died in Kansas City, Missouri on April 28, 1955. He is buried at Osawatomie, Miami County, Kansas. Hi was survived by his wife Freda B. Rowold, 4017 Virginia Avenue, Kansas City, Missouri; and by four brothers and three sisters.